The Texas Transportation Commission has completed the process of designating 1.5 miles of State Highway 550 in Brownsville as Interstate 169 -- the latest addition to the I-69 Texas System. 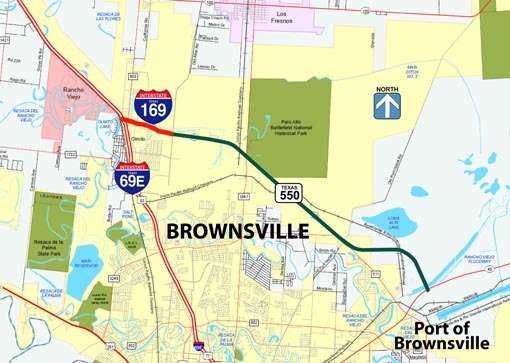 SH 550 is being developed by the Cameron County Regional Mobility Authority (CCRMA) and provides a 10-mile long connection primarily for truck traffic between Interstate 69E and the deepwater Port of Brownsville. TxDOT participated in funding construction of the SH 550 direct-connect interchange with I-69E. Federal highway legislation passed in the 1990s added Brownsville's Farm to Market Road 511 (now SH 550) to National High Priority Corridor 18 as part of the future I-69 system. The first 1.5 miles of SH 550 east of I-69E have been added to the national Interstate Highway System. The remaining 8.5 miles includes two sections which must be constructed to interstate highway standards before the entire roadway can be designated as Interstate 169. Cameron County Judge Pete Sepulveda Jr. anticipates those additional improvements to SH 550 will be completed over the next two years. I-169/SH 550 is a limited access toll facility. It provides an easier, faster and safer route to points such as Port Isabel and South Padre Island and is helping alleviate traffic congestion in other areas of Cameron County. The highway system in the Lower Rio Grande Valley has been dramatically improved over the past 20 years and today there are 120 miles of the Interstate Highway in Cameron, Hidalgo and Willacy Counties. The region, however, remains the most populous in the nation that is not yet connected to the rest of the Interstate Highway System. 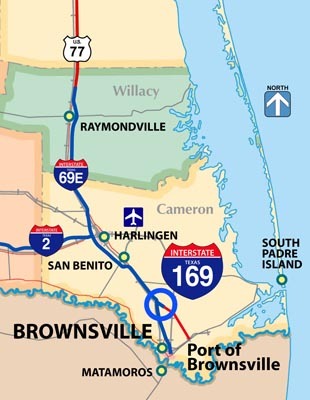 Cameron County officials have been strong advocates of upgrades needed to complete the interstate connection from Brownsville to Interstate 37 at Corpus Christi.